All three were begun as always with a dry-brushing of chainmail, and this was followed with me picking out any bits that I deemed appropriate with the chocolate brown before they were highlighted with leather brown. Skids, then also had more chocolate brown highlighted with a mixture of more chocolate brown mixed with a bit of coffee on all his fur bits. Then turning to his jeans I undercoated these in blue grey, before highlighting them in light blue. His flesh came next this was my usual mix of a European flesh undercoat with highlights of the same with some pale flesh added. His boots were left black along with his gloves and highlights were applied to these in dark grey. A couple of his safety pads I painted dark red with bright red highlights, to add a splash of colour, and his earrings I did in copper with shining gold highlights. The odd dot of day-glow green was added to the bits of “tech” hanging about his person. That just left his “Mohican” haircut (why in a post-apocalyptic world do people always have these ridiculous hairstyles! ), this was undercoated in plum and then more plum was mixed with lavender and used as a dry-brush adding more lavender to the mix as I worked my way up from the roots to the tips. Bubba, was begun as the above but this time with a highlight of butternut over the handle of his “bang stick”. 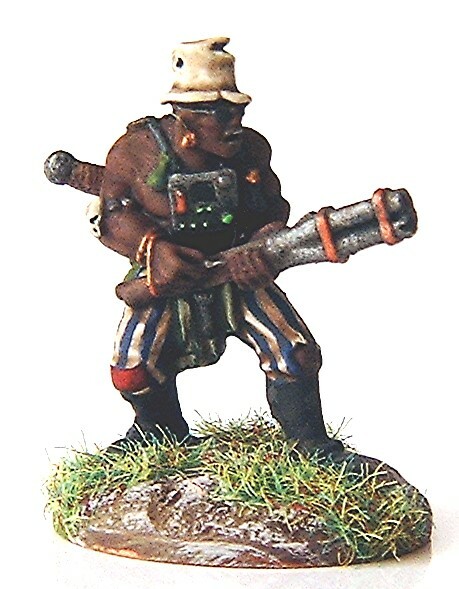 I then undercoated his trousers in coffee with cream forming the highlights here. I added the stripes next in navy blue with highlights of dark blue, I then added the patch on his right knee with some dark red and bright red. The cloth hanging at his waist I added in rifleman green with stone green highlights. His flesh came next so chocolate brown was used for an undercoat here, and the same mixed with a little European flesh took care of the highlights. He has a couple of small pouched about his attire so deep bronze green highlighted with olive was used on these. Copper was added here and there and when on pieces of his jewelry this was highlighted with a bit of shinning gold. His teeth were added in white, and then his hat and the small skull on his arm were added in coffee with cream highlights. 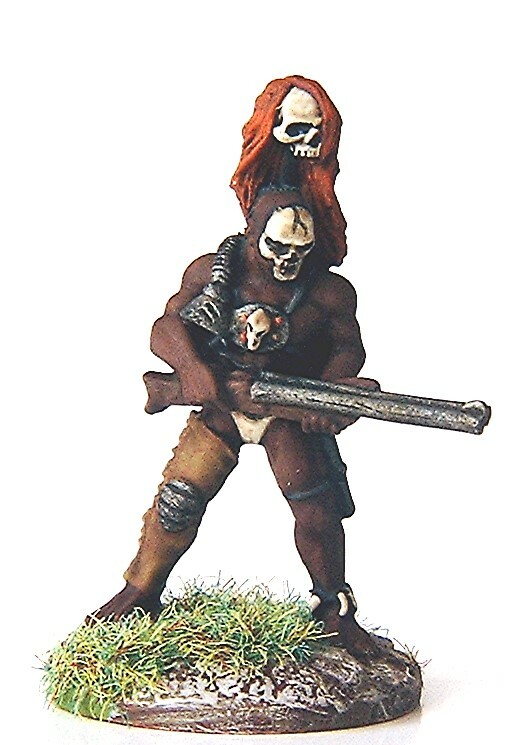 Skull, painting on my “budgie smuggling” savage, was begun much as the above, and indeed his flesh was painted in the same manner as “Bubba”, the only really changes concerned his single “chap” and this was first painted leather brown and then highlighted in khaki, his rifle stock was chocolate brown with butternut highlights, the tank on his back (that you can’t see in the photo but believe me it’s there!) 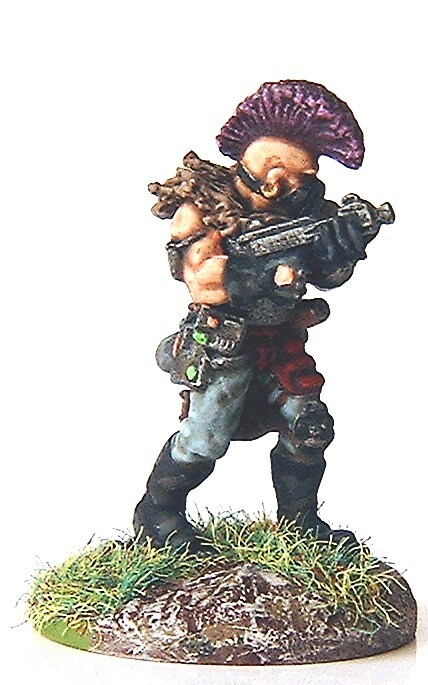 which was dark red with bright red highlight and a dry-brushing of chainmail, and his pants, skulls and face paint which were all done in coffee with cream highlights. 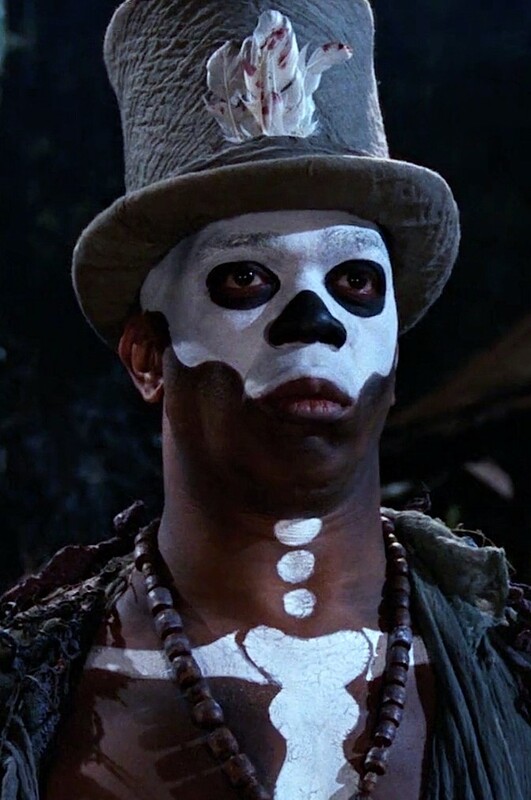 I decided to paint the skull on his face as after adding the white top hat to Bubba it reminded me of this chap from the James Bond movie “Live and let die”, see right, so thought it would look rather cool if Skull had something similar too, this was first outlined in black, while I was adding the pupils to his eyes, then the skull was added in coffee, highlighted in cream and the nose, teeth and crack were then added in more black, I think it looks quite cool! Lastly I added the hair on the skull atop his “sashimono” in chestnut and orange and he too was finished. I’m really pleased to see these guys finished, Roger, especially so as I helped to fund them. Cracking paint jobs on all and they look very different to my painted versions. It’s always interesting to see different people take on the same figures. Great models. Superb paintjobs. Really well done Roger! These three look like rejects from the Humungus’ gang. Perfect post apocalyptic bad guys! Thanks Harry, I think the figures were very much inspired by “Mad Max 2” when they first came out, there is even a hockey masked “Humungus” lookalike. That’s pretty cool. I’m not into PA gaming (yet) but I could paint some of those models for fun. As always, the step-by-step is very useful. Goves me ideas on painting and even colors to match. Great stuff Roger! There are more, but these should get you started, Cheers Roger. But I’m waxing my balls tonight so maybe next week. What brilliant characters, lovely work Roger. Thank you Michael, most appreciated. Top stuff. Have to say I really like the mohawked figure and the colours you’ve used – saved the photo for inspiration and I may just buy one of those figures myself. Love these Roger, though I keep looking for Auntie…oh that’s Thunderdome! Also, how do you do the photos without backgrounds? And let’s see these dudes in a game? Thanks Mark, I have thought of looking for (or converting) an Auntie figure but “I don’t need another hero” (sorry) would be kinda cool though. “Apocalyptic fun”, who wouldn’t want to spend all day driving about on a big V8 with a stupid haircut! Sorry there is no great secret to how I get the figures “floating without a background! I just photograph them against a shiny piece of white card that came out of the bin at work. Sorry for butting in. Four A Miniatures. Make a Tina Turner – Mad Max figure. 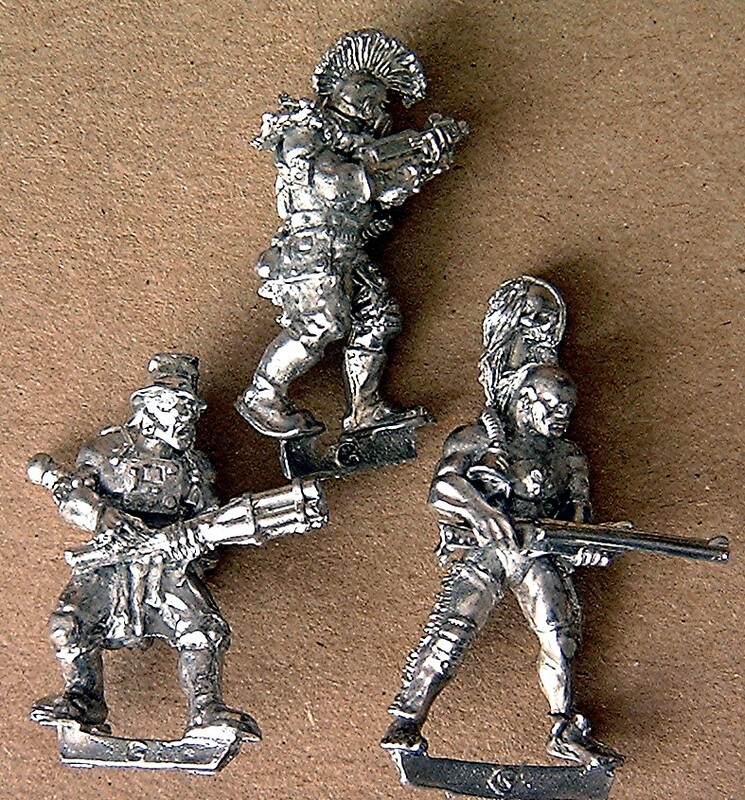 I think the Virginia figure is also from another of the (Mel Gibson) Mad Max films? I’ve bought from Andy (Four A) from the shows and via PayPal/mail order and there’s no issues that I’ve encountered. They also have a lot of very nice figures there (the Creature from the Black Lagoon, is another on my wish list now too). Virginia is indeed from “Mad Max 2”, I’ve met the real Virginia Haye at a comi-con and she is lovely. cheers Roger.